339 pages, 78 species accounts, 20 colored plates, 23 monochrome plates. Hardbound with dust jacket. ISBN 978-0-9796633-3-8. Published in 2018 by the Wedge Entomological Research Foundation. This is the first of two volumes treating North American Notodontidae. This volume also includes North American Doidae. Seven subfamilies of Notodontidae are revised: Pygaerinae, Notodontinae, Cerurinae, Phalerinae, Periergosinae, Dudusinae, and Hemiceratinae. The Notodontidae included in this volume are 75 species assigned to 17 genera. The Doidae includes three species in two genera. For Notodontidae, two new genera and eight new species are proposed. Keys to the adults of all 17 genera and 75 species are included. Adults are illustrated in color, and male and female genitalia are illustrated by line drawings or photographic images. 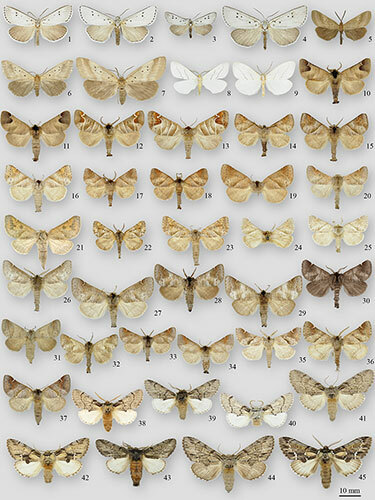 Larvae of two species of Doidae and 64 species of Nearctic Notodontidae are illustrated in color. Many new life histories are reported, with larvae of these species being figured and diagnosed here for the first time. Included are larval representatives of all notodontid genera known to breed north of Mexico. The volume is approximately 339 pages of text. Included are 23 monochrome plates, 11 color plates of adults, and 9 color plates of larvae. The book will be Smythe sewn (to lie flat when open) and hardbound in cloth.